Set photos reveal an early glimpse of the teen mutant superhero's signature look. 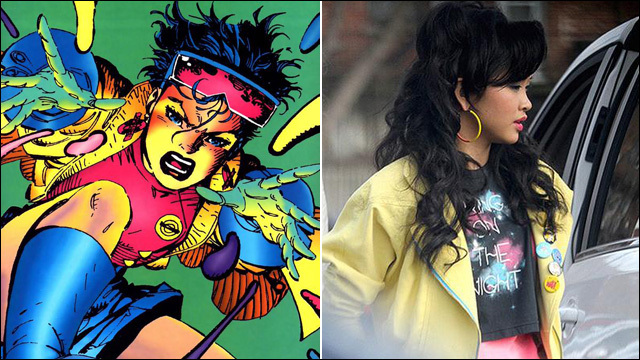 Filming on the latest X-Men movie, X-Men: Apocalypse officially began in Montreal earlier this week, so a few photos from the set have inevitably trickled out to social media, giving X-fans an unofficial first glimpse at some of their favorite young mutant superheroes -- including Lana Condor as Jubilee. As you can see, she is rocking Jubilee's signature yellow jacket. Those familiar with Jubilee's origin story will remember she was introduced in the pages of The Uncanny X-Men as a mutant teen mallrat. X-Men: Apocalypse is set for release on May 27, 2016.